You’d think the United States, a country that hosts many of the world’s most powerful tech companies, would show off some strong design chops on its official websites. Alas, that is rarely the case; just look at the FBI’s page, which looks like it was pulled out of 2005. Thankfully, that should be changing soon. 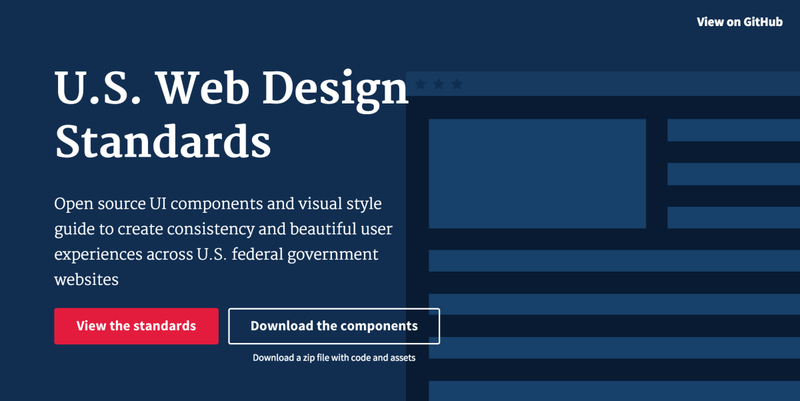 The US Chief Information Officer (CIO) Council – which itself has a pretty outdated website – has released a new set of guidelines and open-source components to help government websites get started on clean, flexible designs that look appropriate for the times. The new guidelines were made to help developers and designers take advantage of simple tools and to deliver high quality content. The standards were built to comply with accessibility standards, from color to code. The CIO says it’s reviewed and repurposed patterns, code and designs from government a private style guides to use established best practices. The CIO also emphasizes using common UI components as well as 508-compliant colors and typography. Simple, responsive design from the government’s voting registration page. There are a few pages already using the new standards, including vote.usa.gov, and the US Digital Services Playbook. Though it’s up to each individual site to implement the new standards, the examples so far are a marked improvement over the inconsistent and cluttered collection of current government websites. To learn more about what to expect – or if you happen to work on a .gov website – the full set of standards can be seen here; you can also provide feedback on GitHub. Here’s to hoping websites move to adapt the guidelines soon.